Bookcase carved 1915-18, Alan Field Payne . Who was Nellie Payne? Bookcase carved for Alan Field Payne. 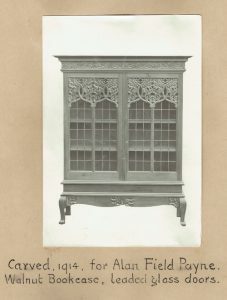 This bookcase is made from walnut timber and was designed and carved for Nellie’s son, Alan Field Payne. We assume it was carved whilst Alan (and his brother Geoffrey) were away at war. Nellie had something in common with all other mothers of sons serving with the Australian forces – intense anxiety. Nellie had both sons serving in France and Flanders where the fighting was most fierce and deadly. Nellie’s husband, Dr. Payne, had been one of the first to offer his services, and was employed firstly as Principal Medical Officer of Claremont Camp in Tasmania, and then on troop transport ships looking after the wounded whilst the ships threaded their way home through seas filled with the risk of mine, torpedo or hostile raiders. After France and Flanders, Alan was sent to England to undergo the hazardous training of a fighter pilot in the Australian Flying Corps. In the primitive aircraft then in use, the casualties among trainee pilots was almost as heavy as those that took place in combat on the ground. But he survived. Nellie constant anxiety during the war for family and friends’ sons, was punctuated in September 1916 when she received a phone call from Government House saying that Governor William Ellison-Macartney, wished to speak with her. He announced to Nellie, that as Chairman of the Rhodes Scholarship Committee, he wished to advise her that her son Alan had been chosen as Tasmania’s Rhodes Scholar for 1917. Nellie was extremely proud and excited and on 19 December through a small luncheon to celebrate, even though the guest of honour, Alan, was still fighting in the war. The end of the war had found Alan instructing pilots for the Australian flying corps, and after the Armistice he had taken up his Rhodes Scholarship at Oxford. He had taken his Bachelor of Science degree there with honours, and then joined the famous engineering firm of Armstrong Whitworth, who had sent him to work on the construction of dams and railways in Sudan. On returning to Australia he was employed first as an engineer with the State Rivers and Water Supply Commission of Victoria and afterwards as assistant engineer with the Melbourne and Metropolitan Board of Works. Alan had become close friends during the war with Philip Hudson, and back in Victoria they renewed their friendship whilst Philip was working on designing the Shrine of Remembrance. Philip and his wife had been hospitable to Alan and Nellie had invited them to visit her and Dr Payne in their new home at 26 Antill Street in Hobart. On returning to Victoria he had prepared a handsome sandstone plaque which bore in sculptured relief the representation of a sailing ship, and the name “Sabraon” beneath. This he presented to Nellie who had it affixed to the front as the house’s permanent nameplate. The “Sabraon” had been the name of the ship on which Dr Payne had arrived from England. Later, it fell upon the shoulders of young Philip Hudson to convey the very sad news to Nellie and Dr Payne that Alan had died from drowning whilst out with friends in Victoria. This was in 1925 when he was just 29 years old. This was naturally a crippling blow to Nellie, but little did she know that just 7 months later she would also lose her husband. After this massive double blow Nellie required a respite, a rest and a change of scene to recover from all of this. So she spent time with her sister Ethel in Launceston and at Westfield, her own original home which was now owned by her brother, Richard where she found beauty, serenity and happy memories to help her restart her life. This beautiful bookcase is now in England with Nellie’s granddaughter.